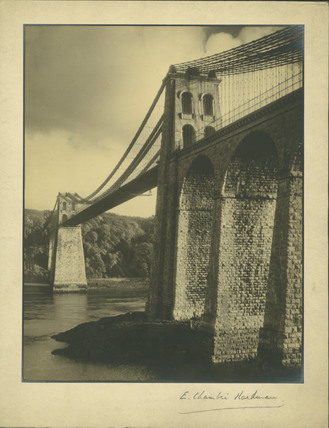 Photograph of the Menai Suspension Bridge, one of the best known works of Thomas Telford (1757- 1834). It crosses the Menai Straits from Anglesey to Bangor. Hardman successfully captures the grandeur of this impressive piece of engineering. The specifications for the bridge, constructed 1819-1826, was that is needed to be high enough to let the largest ships to sail below with masts erect. The bridge, at the time of its construction in the 1820s, was the longest bridge in the world at that time. Two towers, 153 feet above the high-water mark , had sixteen chains hanging from them holding , each 9-foot. These chains held up roadway, 579 feet in length and 30 foot wide. Between 1938 and 1940 the old iron chains were replaced with new steel ones, all while traffic continued to cross. The stone used for the arches and piers was limestone quarried from Penmon Quarries at the north end of the strait, then carried down by boat. The ironwork came from Hazeldean's foundry near Shrewsbury. On the reverse of 508.01 it says Menai Suspension Bridge- Linking Anglesey with the Mainland.